In a stunning move that took almost every political analyst in the country by surprise, sacked Cosatu Secretary General Zwelinzima Vavi will replace Julius Malema at the head of the Economic Freedom Fighters until the Commander in Chief has warded off corruption charges. And along with him comes another out-of-left-field appointment. By DAILY MAVERICK STUFF REPORTER. NB. This article is our 2014 April Fools offering’. During a shock press conference called overnight by the Economic Freedom Fighters (EFF), President and Commander in Chief Julius Sello Malema said that he would step down from his leadership roles with immediate effect in order to fight a slew corruption charges regarding the non-payment of taxes. In his stead, recently fired former Cosatu general secretary Zwelinzima Vavi will take over both roles on an interim basis. Vavi has a reputation for calling lengthy press conferences in which he says nothing, but on this occasion the information spilled out at a near supersonic rate. Vavi will bring a wealth of organisational know-how from his many years as a union organiser, and the EFF CCT were particularly excited about his experience in acquiring party headquarters. 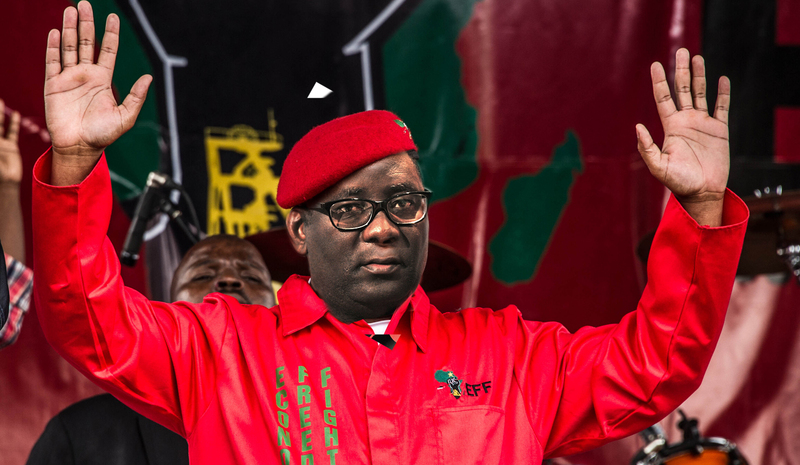 In a second shock announcement, Vavi was joined on stage by suspended Independent Police Investigative Directorate (IPID) head Robert McBride, the troubled South African police services stalwart who will now act as the EFF’s Head of War Council (HOWC). He wore the EFF security forces’ signature red overalls and black riot gear, and repeatedly raised a small handgun and fired shots into the ceiling. The newly revamped EFF is the third iteration of a party that saw founding members Andile Mngxitama and Khanyisile Litchfield-Tshabalala, among others, leave the fold after an acrimonious peoples’ conference in Bloemfontein last December. Vavi and McBride have also been subject to their own interminable controversies. With all this bad blood, asked reporters, how could the nascent party win the confidence of undecided voters?